The Canon EOS 6D Mark II camera is a delight to use, and fits a price range that is far more user-friendly to your credit card than most full-frame sensor cameras. I found the camera to be very similar (buttons and dials in familiar places) to the other Canon cameras I use — including my current Canon EOS-1D X Mark II and EOS 5D Mark IV cameras. 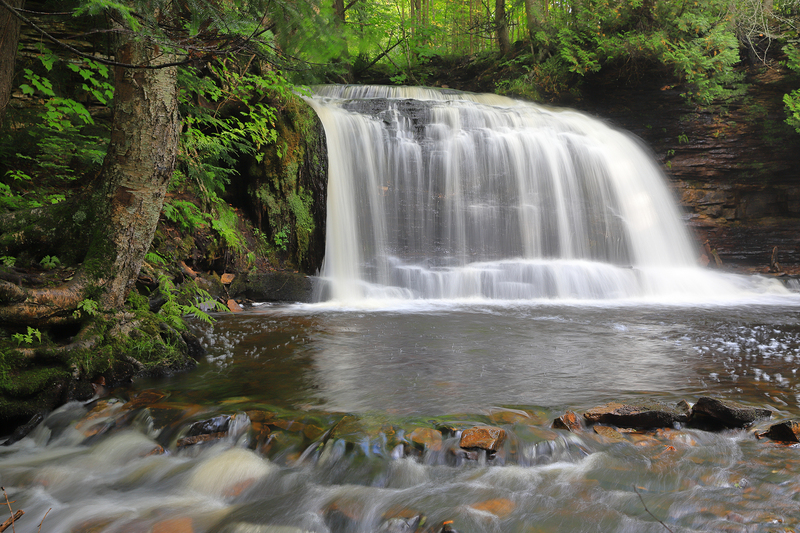 Silver Bell Falls is a delight to photograph deep in the forest north of Chatham, Michigan. It photographs best from late summer to mid-spring when the mosquitos aren’t present! Canon EOS 6D Mark II, EF 24-70mm f/2.8L II USM set at 35mm, .8 second shutter speed, f/8, ISO 100, Auto White Balance, Live View, Landscape Picture Style, and a polarizer to reduce the glare on the damp black rocks. With no crop factor from a smaller sensor, wide-angle lenses remain wide. There is no need to buy special lenses that provide extra wide focal lengths to accommodate small sensors. Noise causes image problems, especially when using high ISOs or long exposures. Full-frame sensors have more real estate, so individual pixels can be larger, reducing the noise problem while increasing the dynamic range that can be captured. The viewfinder in a full-frame camera is usually larger, enhancing your view of most subjects. Sometimes wildlife approaches too closely. With a full-frame sensor camera, often you can still photograph the subject without cutting part of it off that would have been necessary with the crop of a small sensor camera. If the subject isn’t large enough in the image, then it can always be cropped later using Canon’s own free Digital Photo Professional (DPP) version 4 software. In other words, you are not forced to use the crop as you shoot, but can later if necessary with software. The one key feature on the 6D Mark II I really like is the articulating LCD display. Often in landscape and close-up photography, the camera must be put in a spot where it is not convenient to view the LCD — especially when using a tripod. With this camera, the LCD can be pulled out and placed at many different angles to allow easy viewing and to focus using Live View. You can even fire the shutter by gently tapping the LCD, with the Touch Shutter feature. Now that is convenience! None of my other Canon cameras have ever had this feature. As I age, convenience is increasingly important to me! Today I use the Touch Shutter most of the time when making close-up and landscape images. 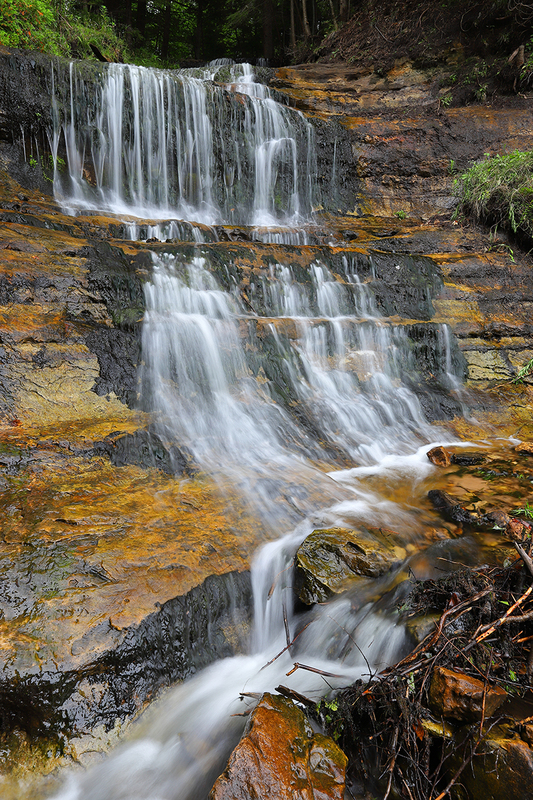 Alger Falls near Munising, MI photographs best immediately after a heavy rain, when the waterflow is greatest. Knee-high muck boots are needed to walk to the base of this waterfall, where the EF 16-35mm f/2.8L II USM lens works well to make a strong composition. Canon EOS 6D Mark II, Manual exposure with Evaluative metering, ½ second shutter speed, f/13, ISO 100, Auto White Balance. A circular polarizer on the lens reduced the glare on the damp rocks. The image was taken by slightly touching the LCD (with the Touch Shutter feature active), and the two-second self-timer was used to let any vibration disappear before the image was shot. The Canon 6D Mark II offers numerous settings that can be chosen based on needs and user preference. Let’s consider many that I find most useful for landscapes and close-ups. I shoot full-res RAW images only, but ten total choices are offered, including three RAW and seven JPEG sizes. Pick what you like. I like to examine images on the camera’s LCD, so I set the timer to four seconds to give me a little more time. When using Canon Speedlite gear mounted to the hot shoe, many Speedlite settings can be done in-camera and these are transferred wirelessly to the external Speedlites in use. This large dragonfly quietly rested on the autumn cattail overnight. When dawn arrived, it was too cold to fly away as I slowly approached with the Canon 6D Mark II and an EF 180mm f/3.5L Macro lens already attached to the tripod. Knowing it would begin to move as the sun rose, I had to shoot quickly in the dim light before sunrise. I manually set the ambient exposure to be about one stop underexposed. This darkened both the background and the dragonfly, but neither appeared black with no detail. Then I used a Canon 600EX-RT Speedlite with the ST-E3-RT radio transmitter to fire a flash, to ideally expose the dragonfly while the more distant background remained dark. The ambient exposure was four seconds, f/14, and ISO 200 with Evaluative metering. Since I shoot only RAW images, I use Auto white balance and adjust white balance later when I process the image. The self-timer was set to two seconds and the Live View was on. I manually focused the lens on the back of the dragonfly and then gently touched the LCD touchscreen to fire the camera. The two options are sRGB and a wider color space called Adobe RGB. Since I process my RAW images and often use them in high-end publications, I prefer Adobe RGB, but for online use, you may well prefer the standard sRGB setting. I use Standard for the RAW files I shoot, but for JPEGs, the more colorful and sharper Landscape option is effective for landscapes. And close-up photographers might wish to use Fine Detail. Rock River Falls is one of the nicest waterfalls in Michigan’s Upper Peninsula, but it does require a mile of hiking a muddy trail to reach it. Fortunately, the Canon EOS 6D Mark II and the EF 24-70mm f/2.8L II USM aren’t heavy or bulky to carry. Exposure was a shutter speed of .6 seconds, f/8, ISO 100. I photograph all waterfalls using Manual exposure and merely add exposure until the first blinking highlights appear in the whitest water. A polarizer subdues reflections on the water. Auto White Balance makes the colors suitable, but I always tweak them when I process the image. The Landscape Picture Style used here also enhances the colors. The camera was tripped by touching the LCD with the two-second self-timer activated. The zoom on the lens was set at 41mm. This is an enormously powerful tool. From two to nine images can be shot and then the camera puts them together. I use this feature a lot to fire one or more flashes multiple times to light various objects, or an object at quite a distance. And it is highly effective for landscape photographers at night. Light a foreground object with flash, or flashlight, and then change the lens focus, aperture, shutter speed, and white balance to optimally expose the night sky. The ISO must remain the same, but the others are adjustable from one shot to the next in the Multiple Exposure mode. Landscape photographers should not miss the Select image for multi. expo. option! For example, if you have a landscape shot in the evening that could benefit from placing a moon in it, now you can do it in-camera. With an existing RAW night shot on your card, select this option, and then locate the “source” image (in this example, your existing evening landscape shot). The camera copies the existing image and makes it the first of a multiple exposure. Now add a new shot of the moon. Use Live View and the first landscape image appears on the LCD. This makes it simple to compose the moon exactly in the image where it will do the most good and you know how large to make it. Shoot that new image of the moon, and it’s added by the camera to the first shot. By the way, a good exposure starting point for the full moon is 1/ISO at f/11. If you are using ISO 3200, then 1/3200th second shutter speed with f/11 does the trick. For a dark starry night where you really want the stars to be obvious, try ISO 3200, 20 seconds, and f/2.8. Reduce the dynamic range in a high-contrast scene and saturate the colors at the same time. I like to use +- 2EV with the Art Vivid effect to saturate the colors, but you may find the other choices — Natural, Art Standard, Art Bold, and Art Embossed — suit your taste better. This mode can only be used when JPEG is set. Be sure to explore its features! When making landscape or close-up images while shooting on a tripod, use this option to put the mirror up prior to the actual exposure to avoid the slight vibrations caused by the moving mirror and you’ll obtain sharper images. Be certain to enable this function. Live View is enormously useful for both landscape and close-up photography, and invaluable when you shoot from a tripod. Focusing manually on a specific object in the scene with a magnified Live View image is easy and precise! 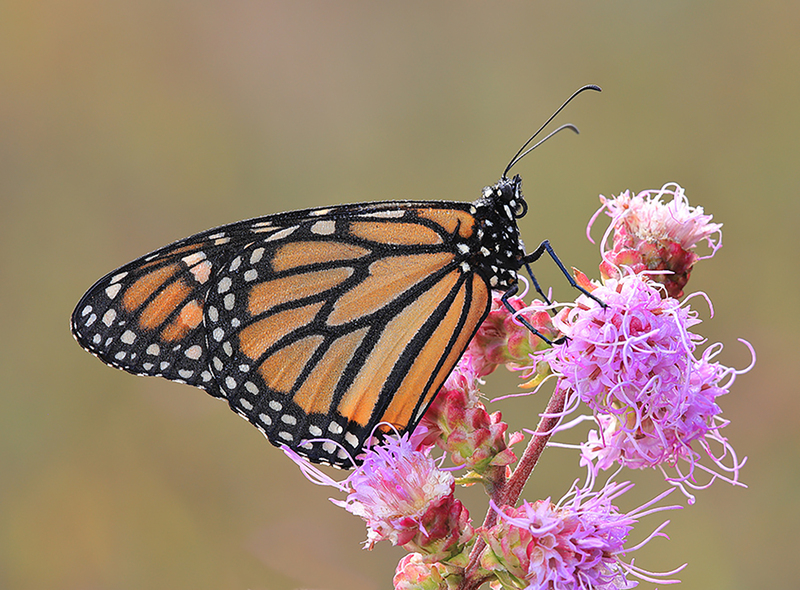 This dew-laden monarch butterfly will continue its long journey to Mexico, where it will overwinter with millions of other monarchs. I used Manual metering and focusing using the Canon EOS 6D Mark II articulating LCD. Magnify the butterfly’s image on the LCD and focus on the black lines on the wings, since they are easy to see. My Manual exposure was a shutter speed of 1.3 seconds, f/14, and ISO 400. With the EF 180mm f/3.5L Macro lens attached to the ballhead on a sturdy tripod, I fired the image using a two-second self-timer by gently touching the LCD (with Touch Shutter active); the screen’s Touch Control was set to Sensitive. Activate this so areas that might have too much exposure blink off and on when viewed on the camera’s LCD. Observing the “blinkies” and noticing when they first appear is an excellent way to arrive at a fine digital exposure. 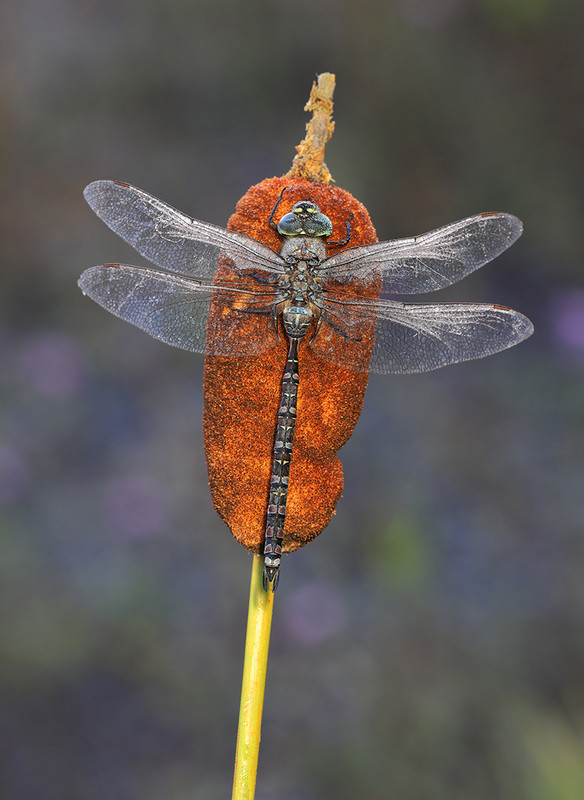 Dragonflies commonly roost near the top of grasses and flowers in low meadows. 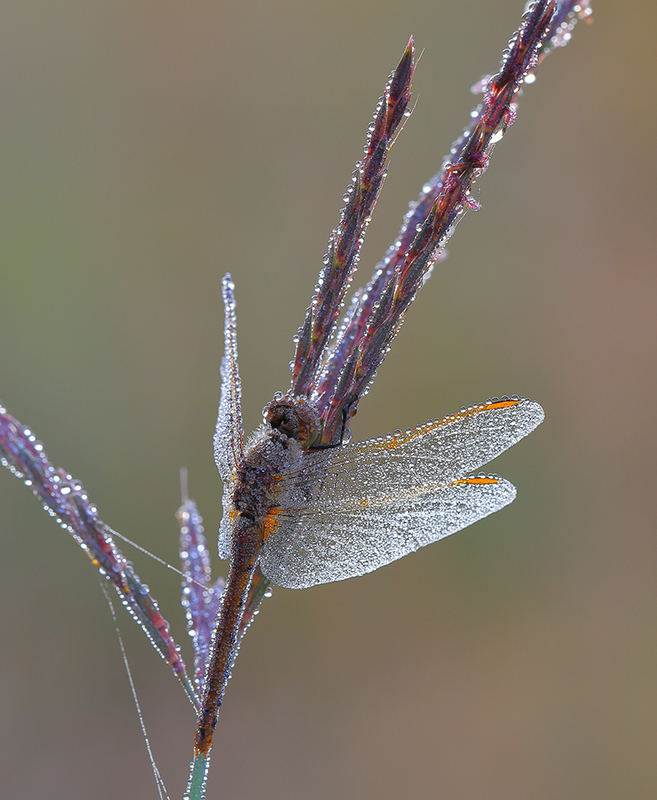 On a dewy morning, they are easily spotted by looking carefully while walking east, so look for bright spots in large dewy areas – they might be a dragonfly or butterfly! I always use Manual exposure and focusing when making close-up images. By using Evaluative metering, I adjust the exposure manually until the first “blinkies” or flashing highlights appear on the LCD. My exposure for this image was 1/13th second, f/14, and ISO 200. Auto ISO produced standard colors that I modify with Canon’s DPP4 software later. I used Live View to both focus and fire the camera, along with the two-second self-timer. It is helpful to know where the AF points are in the camera’s viewfinder. Turn this on so you can see all AF points available. The point(s) you’re using appear as larger boxes in the viewfinder, but all remaining AF points are visible as small boxes. Cameras like the EOS 6D Mark II have an LCD overlay in their eye-level viewfinder, and useful information can be included or not, as you choose. One thing I find useful is to show the location of every available AF point, aside from the one(s) I'm currently using. 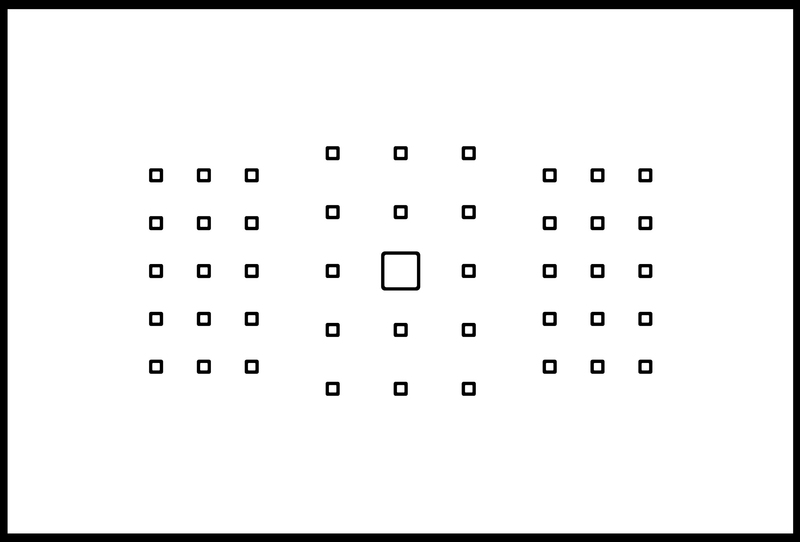 With the EOS 6D Mark II, this simulated graphic shows all available AF points as small boxes, while the active AF point is easily identified by its larger size. The default setting is the Brightness display that averages the color channels together. I find the RGB option is more useful. It shows the histogram for the blue, red, and green color channels. If a color is seriously climbing the right wall of the histogram, reduce the exposure somewhat to avoid an unnatural shade of that color due to overexposure. This can also be helpful if you need to shift white balance, to counter an over-abundance of a particular color tone. Vertical images will be small if the image is displayed vertically on the LCD. Select the second option where the image is automatically displayed vertically when viewed on the computer screen, but not on the camera’s LCD. Just turn the camera sideways a little to view large, full-screen vertical images on the camera’s LCD. When all the images on the memory card in the camera are stored safely on your computer, and external hard drive, or someplace else, put the card in the camera and Format it to make the card optimally ready to receive new images. This control lets you choose the brightness of the camera’s LCD to suit your taste and viewing conditions. At night, it may be necessary to turn the brightness down, but during the day under bright ambient light, perhaps turning it up makes it easier to see the image. Since this control lets you adjust the brightness of the image as it appears on the LCD, don’t judge the exposure strictly by how the image appears. Be sure to go to this menu choice and switch the Electronic Level from Hide to Show. When activated, a tiny level appears in the viewfinder. This level is enormously useful for keeping the image level and I use it for nearly every photo I shoot. You should use it too! It is far more useful than the level that can be made to appear on the camera’s LCD. The same LCD overlay in the viewfinder makes a Dual Axis Electronic Level visible, at the top of the viewfinder. In this simulated graphic, you see it in the upper-center of the display. When you're actually shooting pictures, you don't see all the registration marks at once -- instead, as the camera is tilted up/down, or to the left/right, you see more and more displayed, indicating the camera is progressively moving away from being totally level. When perfectly level, you only see one mark, in the very center where the level's lines intersect. The default is Standard, but two other choices include Sensitive and Disable. Setting it to sensitive makes the LCD react easier to a very light finger touch. This is helpful when using Live View to select the area where you want the best focus and enlarging that area by touching the magnifying icon on the LCD. And when not in the magnified view, touching the LCD gently to avoid camera-shake to shoot the image is enormously useful. 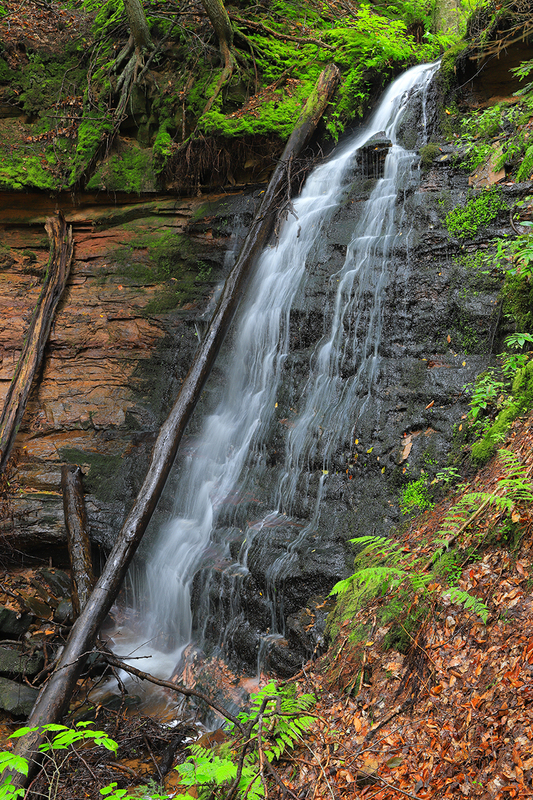 Elliot Falls is a small waterfall on the east side of Miner’s Beach in Pictured Rocks National Lakeshore. 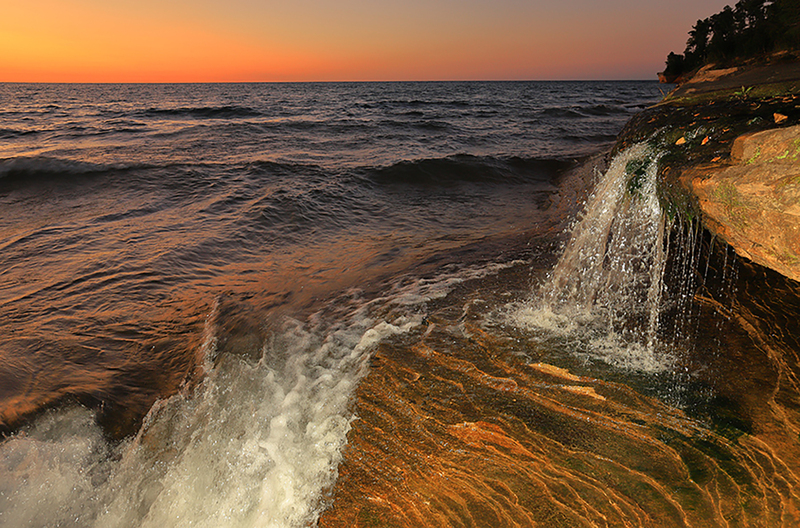 It is fun to photograph because the Lake Superior waves often provide an interesting background. I used a Canon 600EX-RT Speedlite to brighten the foreground while setting the ambient light exposure a little underexposed to saturate the red glow in the northern sky after sunset. Canon EOS 6D Mark II, EF 16-35mm f/2.8L II USM lens, Manual ambient exposure, ISO 400, 1/25th second, f/8.0, Auto White Balance, and a two-second self-timer. As I always do with landscapes and close-ups, I fired the camera by gently touching the LCD screen because the Touch Control was set to Sensitive. This works amazingly well! If you have a lot of camera settings that you prefer for a certain situation, registering them to C1 or C2 makes the camera easy to switch over to those settings. For example, when doing the starry night sky, I often use ISO 3200, a shutter speed of 20 seconds, f/2.8, 3200K (Kelvin) white balance, and Manual exposure. I assign this to C1, and to set the camera to these choices, all I do is rotate the exposure dial on top of the camera to C1. Here is a quick run-down of different 6D Mark II Custom Functions I find useful, in different types of nature and wildlife photography. Like many recent Canon EOS cameras, the 6D Mark II breaks its Custom Functions into distinct categories, identified with a Roman numeral, based on what they allow you to change. The first are those that deal with Exposure control. When using an autoexposure mode such as Shutter Priority or Aperture Priority, setting this option to 2: ISO speed, allows the camera to switch to a more suitable ISO if it runs out of room to change aperture (in Tv mode) or shutter speed (in Av) to maintain the exposure. This is a hugely worthwhile setting, especially for wildlife photography. The three choices: release, equal priority, and focus, tell the camera what to emphasize. 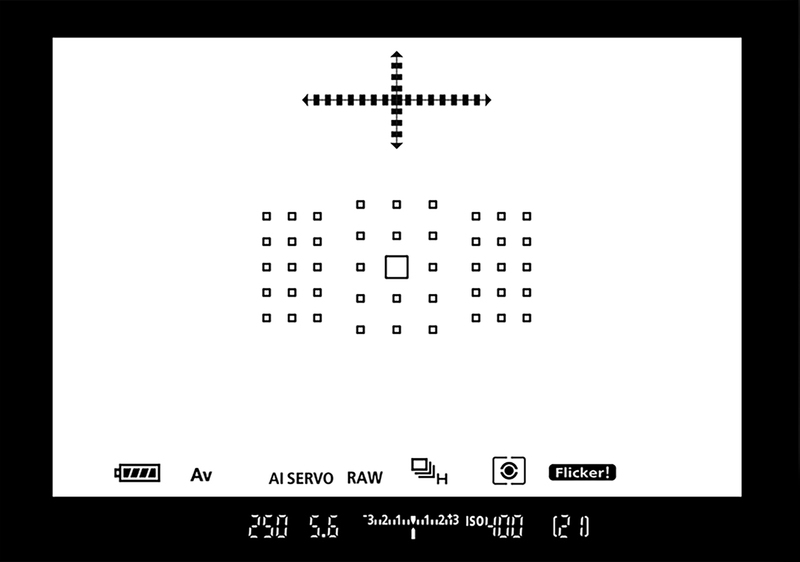 If you use back-button focusing, then it works best to select release, as you may have focused on the important target properly, but when you recompose, the AF points are no longer on the focused target, though the lens remains properly focused. The camera won’t fire unless the AF points are on something in focus. Setting the camera to Release lets the camera shoot no matter what the active AF points are on. When making landscape images using autofocus, invariably the AF point that works best for a horizontal ideal choice is different than the optimum AF point location for a vertical composition. This option lets the camera remember a different AF point to use for horizontal and vertical compositions, and return to them instantly as you rotate the camera. I always use it with excellent success. The default is 0: Selected (constant). When you must navigate to different AF points as you change composition, it is helpful to see at a glance where all possible AF points are located. Setting 1: All (constant) does the trick for you. Should you notice a lens is always focusing a little closer than it should (front focus) or a little too deep (back focus), use this option to calibrate your lens to make it focus squarely on the target at the exact distance. Most of the time this feature is not needed, but if either front or back focusing is a problem, this function lets you recalibrate the lens. I always use this custom function to make my exposure dials more intuitive. By setting the dials to Reverse direction, turning the aperture dial on the rear of the camera clockwise opens the aperture, adds light to the exposure, and the histogram data moves to the right as well. Turning the dial on top of the camera clockwise as viewed from camera rear slows the shutter speed and that also moves the histogram data right. It simplifies things because you only need to turn either the shutter dial or aperture dial the same direction that you want the histogram data to move. I find this is much easier to remember for making exposure compensations during Manual exposure. This Custom Function lets you re-program nine different controls on the camera, so that they do different things than their factory-default functions. There are many useful camera options found here, so be sure to explore them. For example, you can swap the Main Dial and Quick Control Dial functions, so that turning the Main Dial (top of the camera) changes lens apertures. It can re-configure what the shutter button does when you press it halfway down — primarily, removing AF from the shutter button. Though I never use it for close-ups because manual focusing with a magnified Live View image works much better, setting the shutter button to only start metering (2nd option) is incredibly helpful when using autofocus for landscape and wildlife photography. 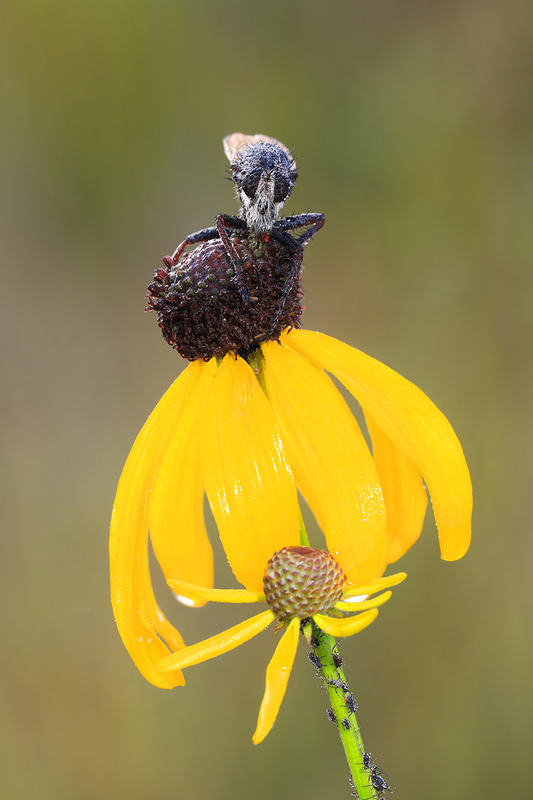 Robber flies are rather large insects that prey on other insects and that includes bumblebees. I commonly find them roosting on flowers in the meadow at dawn. Technique is important for subjects on tall flowers as the slightest air movement makes them wiggle, preventing a sharp image while using longer exposure times (1/5th second in this instance). I used a plamp (plant-clamp) to fasten the flower stem securely, and the EF 180mm f/3.5L Macro lens was mounted on a solid tripod. Canon EOS 6D Mark II, Manual exposure using a shutter speed of 1/5 second, f/16, ISO 200, Auto White Balance, Landscape Picture Style, Live View for focusing and firing the camera, and a two-second self-timer. To open up the shadows underneath the robber fly, I fired a 600EX-RT Speedlite at 1/4 power using Manual flash exposure. Using the Remote Release feature on the radio-compatible Speedlites, I held the 600EX-RT flash in my hand, set in its Receiver mode, while using the radio ST-E3-RT remote Speedlite transmitter in the camera's hot shoe. Pressing the REL (release) button on the off-camera Speedlite fires the camera. I adjusted the flash exposure by setting a different power level for big exposure changes, and then adjusted the flash-to-subject distance for small changes and observed the result on the camera's LCD. I use Speedlites on Manual exposure to achieve sharper images. When using automatic flash exposure with Live View, the mirror must drop down to its normal position for the flash exposure to be measured, and then immediately jumps out of the way to make the image. At slow shutter speeds, the rapid up and down motion of the mirror causes small camera vibrations, which can slightly blur the ambient light portion of the exposure. This allows you to select up to six menu items that you tend to frequently access and change for various situations. By assigning the most useful menu settings to the My Menu Tab, you can find important camera controls quickly without searching for them in the menus. I use it frequently and you will find it helpful too. I assigned Multiple exposure, HDR Mode, Mirror lockup, AF Microadjustment, and Image quality to my Menu screen #1. Up to five My Menu screens can be set up, each with up to six menu items you’d like to have quick access to. The Canon EOS 6D Mark II is a wonderful full-frame camera that delivers excellent quality images while providing numerous controls to allow a lot of creative image-making. And, it offers these at a lower price than many other full-frame DLSR cameras. I highly recommend this camera for the full-frame sensor, fully articulating LCD, and the many in-camera options it offers. Landscape and close-up photographers especially will love this camera.